Dimensions (HxWxD): 1.625" x 1" x 0.75"
We are proud to offer our customers our own line of custom-designed, hand-made gemstone pendants -- Jewelry by Satya -- that comes from fine American jewelers in New York city, whose work is demonstrably of the highest quality. 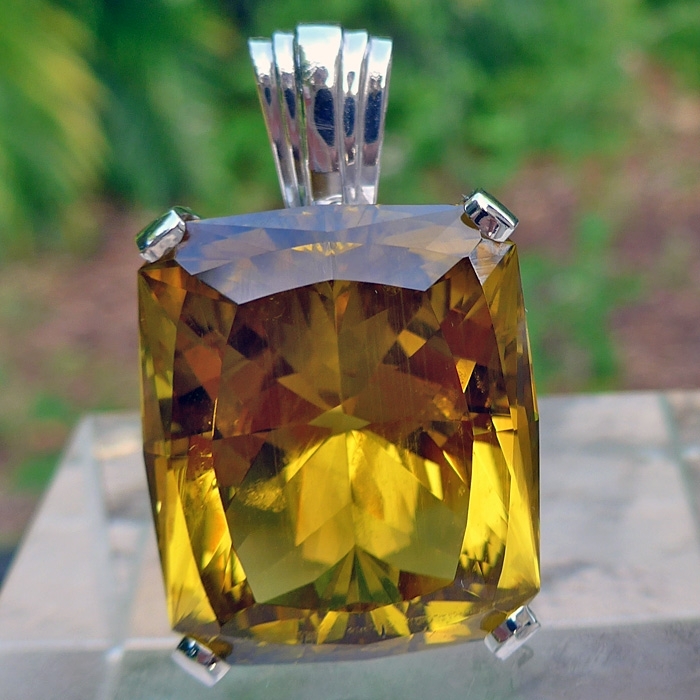 This amazing, huge, 93 carat emerald-cut Brilliant Orange-Gold Heliodor Pendant exhibits the rich greenish-orange-gold hue favored by collectors of fine gemstones. 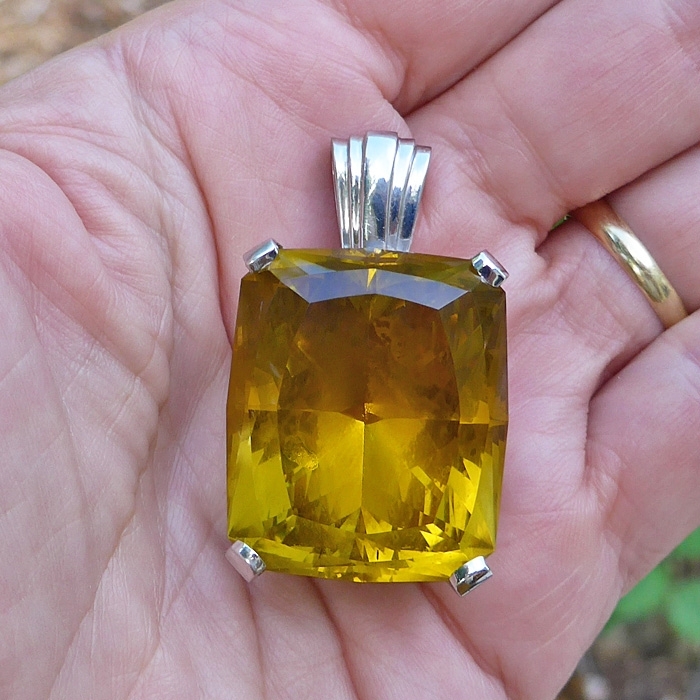 This investment-grade quality example of heliodor comes from Tajikistan. You can see various shots of this treasure on this page. There is also a closeup of the beautiful bale which holds the setting & the stone. Heliodor, discovered in 1910, is a very rare and precious variety of golden beryl. The beryl family of precious gemstones includes emerald, aquamarine, and morganite. Heliodor comes from the Greek and means "present from the Sun". Heliodor is an extremely hard gemstone with a vitreous luster, occurring in hexagonal crystal formations, which can be found in many museums and world-class private collections. Heliodor is also prized by Lightworkers and crystal healers for its unique energetic properties and its powerful and beneficial effects on mind, body and aura. Heliodor is an extremely hard gemstone, much harder than quartz crystal. It is difficult to scratch heliodor, but care should be taken not to put the pendant into one's pocket unprotected along with car keys or other metal objects. Heliodor can be placed in the sun for short periods to charge the stone, and fading is quite unlikely even during sun bathing. Alternatively, the stone can be placed outside in moonlight to absorb Universal Life Force Energy. Metaphysically, Heliodor is renowned as a manifestation gemstone. Those who use visualization in their meditation or spiritual practice, or as an adjunct to affirmation practices designed to bring abundance into their lives will find that this magnificent gemstone supports them in their ability to materialize their dreams and visions for the best and highest good of all concerned. Heliodor combines the energy of the Yellow, the Green and the Golden Rays, activating the solar plexus chakra, the heart chakra and the crown chakra respectively. Working on the third chakra, which is the solar plexus chakra, associated in the Western mystery school tradition with the color yellow, heliodor strengthens the bearer's energy system and infuses the "hara" center and solar plexus with Universal Life Force Energy, also known as "chi" or "prana" in the Chinese and Hindu systems of energy medicine. Heliodor works to increase our personal power by its energizing effect on the third chakra, and is thus a gemstone used to enhance our ability to manifest our personal reality in accordance with our Higher Purpose, enabling us to make our dreams come true in the material world. Working on the fourth chakra, which is the heart chakra, associated in the Western mystery school tradition with the color green, heliodor works to transmute heartache, heartbreak and the deleterious effects of anger we have experienced in our lives, into the energy of unconditional love, healing the wounds we have suffered in our emotional body. Heliodor also empowers us and strengthens us by its energizing effect on the heart chakra, giving us the strength and courage we need to allow our selves to open our hearts fully and experience the compassion known by Jesus and Buddha , the joy and sorrow that accompany the awareness of the interdependence of all living beings. Working on the seventh, or crown chakra, which is associated with the colors violet, gold and white in the Western mystery school traditions, heliodor opens the gateway to Higher Mind, strengthening the energetic connection between the personality and the Higher Self, and helping us to achieve conscious awareness of our Higher Purpose in everything we do and say throughout our busy lives. In addition, heliodor is an ideal gemstone for protection. Used to strengthen the aura and surround the bearer in a bubble of golden light, heliodor provides the bearer with a safe, secure personal space, free from the interference of negative or unwanted individual or collective thoughtforms, deleterious emotional states projected by others, and even inasuspicious astrological influences, which can be literally burned away when they encounter such a strong golden aura as heliodor helps to create. 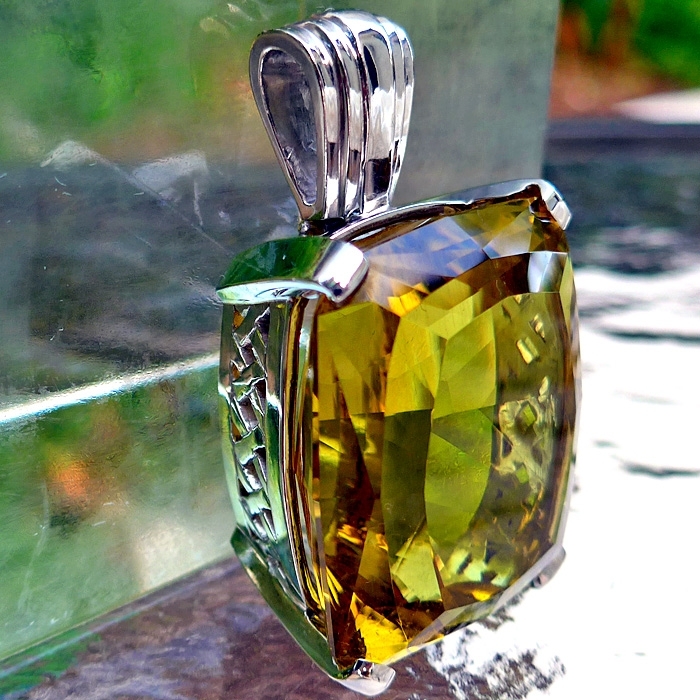 My own personal experience with this particular heliodor gemstone has been quite remarkable. Before we had this gemstone set into its majestic white gold custom made basket setting, I worked with it to determine its metaphysical properties. During meditation, this gemstone assisted me in accessing the Source of Divine Light, the great Father-Mother Source, Shiva-Shakti, and all my Guides and Teachers. I experienced an marked strengthening of my auric field and a powerful connection to my Higher Mind and Higher Purpose that persisted throughout the day. When I have been extremely tired, I worked with this heliodor and felt an immediate sense of increased strength and vitality. Prior to having this amazing gemstone set as a pendant, I tested it in Reiki self-treatments, placing the heliodor in my palm against my chakras, one after another, and the effect was extremely stimulating without agitating my nervous system. Rather, I experienced a feeling of enhanced personal power and a conscious connection to Universal Abundance that is quite remarkable. When feeling extremely tired, I have worked with this heliodor gemstone and have been amazed at how strengthening and empowering this gemstone truly is, banishing all fatigue. This crystal has been completely cleansed with color, crystal energy, Ganges water, prayer and Universal Life Force Energy, and given an energy attunement using Reiki, a Japanese technique of energy healing, so this gemstone will continue to receive and transmit Universal Life Force Energy direct from the Source of Creation. We know you will use this powerful gemstone with loving wisdom and respect its long journey in the Earth that has lasted for many long historical cycles. Thank you Grandmother Earth for this elegant, powerful treasure and spiritual ally to evolving humanity! Weight: Gemstone is 93 carats, or 18.6 grams -- Net weight of pendant is 1.55 ounces. Weight of gold is 33.8 grams, or 1.2 ounces. Above weight is shipping weight.